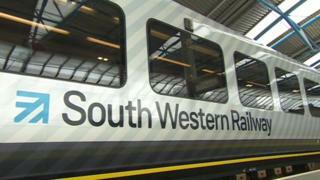 Staff on South Western Railway (SWR) are striking over the role of guards on trains. Their union, the RMT, said 88% had voted in favour of the 48-hour walkout, which began at midnight. The RMT has held seven walkouts and is calling for a guarantee that guards will remain on trains and a halt to the "rolling out of driver-only operation". SWR said it would run nearly two thirds of regular services on Friday and about half of its services on Saturday. RMT staff on Northern will also stage a strike, as part of the same dispute, on Saturday. Northern said it expects to run about 30% of services. The union's general secretary Mick Cash said SWR "has continued to fail to provide any offer that comes close to resolving this dispute and their latest attempts at delaying talks has left us feeling angry and frustrated". He called on the firm to "stop playing with words and negotiate the guard guarantee that reflects the best safety practice elsewhere in the industry". An SWR spokesperson said: "We continue to call on the RMT to talk to us rather than strike." The walkout will affect services to London Waterloo, and passengers face further disruption in the capital due to a 24-hour Tube strike on the Central Line. Walkouts are also planned on Northern on 13 and 20 October.